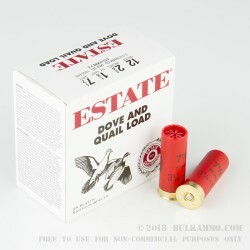 Estate shotgun shells are known for their reliability and consistency. 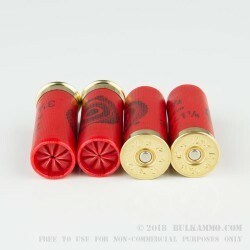 These 12 gauge shells are 2-3/4" Overall length (standard shell length measurement is taken after the shells has been fired), come loaded with 1-1/8" oz. 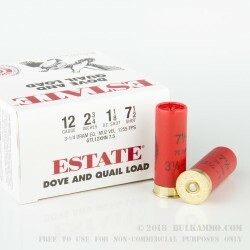 of shot, they are loaded with #7-1/2 Shot, and are ideally suited for dove hunting and quail hunting. In addition to being loaded into low-brass plastic hull shells, the shells are also reloadable and well made with quality components. These shells send their shot out rather quickly at 1255 feet per second, has a *dram equivalent of 3-1/4, and a charge weight of 32 grams. These Estate shells come packaged 25 rounds to a box. Our Estate 12 gauge shells are priced so you can stock up on these for your next hunting trip or your next trip to the range. Need even more? 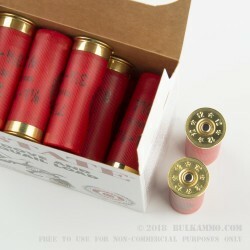 Get the bulk 250 round case for sale here. *The Drams Equivalent basically means how much force this shell has equal to a specific amount of black powder. For example, the amount of force generated by the smokeless powder used in these shells is equal to 3-1/4 drams of black powder. Estate is run under the Vista Outdoors Inc. company umbrella along with multiple other companies.